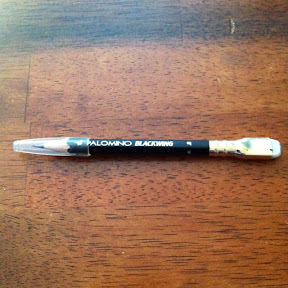 The Palomino Blackwing, is it as good as the original? First of all, I have got to say that I miss the smooth paint of the originals. For me, part of the draw of a good pencil is as a worry stone. I like to carry them around in my pockets (hence the General's Sav-a-point) because when I am teaching my hands often need something to do. That said, this tribute to the original has it's own smooth worry stone feature. The ferrule. 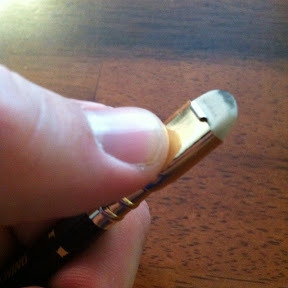 I enjoy carrying this thing around simply for the feel of the ferrule. It has a nice gold finish. CalCedar has raised the bar for themselves with the fit and finish of this beauty. How does it write? Using a standard post-it note you can see that it is not short on darkness at all. Compared to a Turquoise 4B (supposedly the closest led formula to the original BW of which I won't be wasting my last one on a pencil comparison, it is not sharpened) the Palomino is slightly darker and quite a bit smoother. The Turquoise is scratchy where the Palomino is not. In the eraser department, I find myself very satisfied with the performance of the white eraser on this guy. 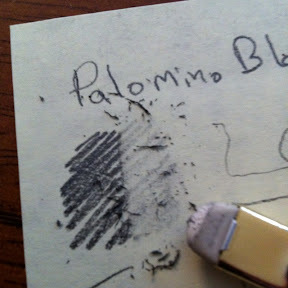 The lead is so black that I don't think many erasers could leave a perfectly clean sheet where there was such blackness. Most importantly, the eraser is not overly abrasive. This is nice if you write in a journal and prefer not to gouge a hole in the page every time you make a mistake. This is my new favorite pencil. 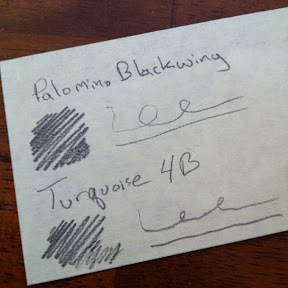 Hoping to get my hands on the new version ( Timberlines: Reviving the Blacking: The All New Palomino Blackwing 602) as soon as it is available.